A network of smart appliances could revolutionise energy efficiency but suppliers must agree on common specifications. By 2020, there will be 24 billion connected devices worldwide, according to Machina Researching. The idea of all manner of devices – from home appliances to state-of- the art home entertainment – sharing information on a common network is fast becoming affordable. 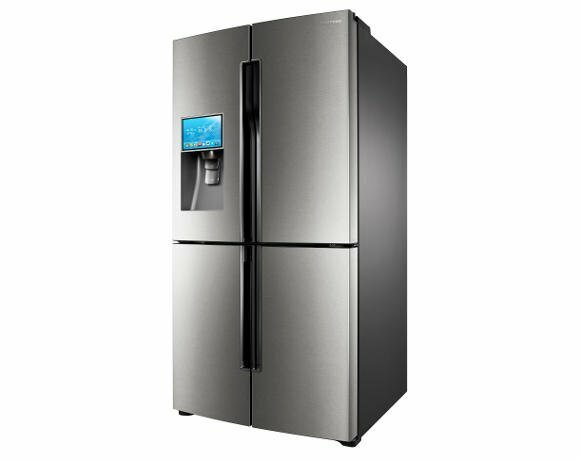 At the Consumer Electronics Show (CES) in January, Samsung unveiled an internet fridge with an LC D screen (pictured) for interacting with recipes and shopping lists with the cloud-based Evernote service. The Samsung appliance can be used for watching TV, or even used to keep an eye on children in a different room, by linking to a smartphone camera. Smart appliances such as Samsung’s online fridge tend to capture people’s imagination but there has been little impact beyond the glitz of the Las Vegas show floor at CES. Some experts predict an acceleration in the number of connected devices in and outside the home in 2013. Standardisation is key to user adoption, says Jerome Rota, senior vicepresident of consumer products and services at Twonky, which makes media sharing platforms. “How can we make sure that all these devices, appliances and services are talking to each other and not locking the user into a proprietary and expensive ecosystem? However, Svetlana Grant, director of Smart Cities, Connected Living Programme at the GSMA, says that, while different brands competing in the home can drive down prices, the difficulty lies in using compatible standards to connect devices to a gateway from which to communicate to a wide area network. “No single technology really dominates the market at the moment,” says Grant. “It’s not a market purely Wi-Fi, Bluetooth or mobile, so there is no agreement on what is the lead technology.” The Zigbee Alliance is an organisation comprising businesses, universities and government agencies that campaigns for common wireless standards. It has been trying to create a specification – for high-level communication protocols to support self-organising personal area networks – which can work in application areas where Wi-Fi, Bluetooth or both are unsuitable. Using standards to drive M2M adoption Aria Hotel in Las Vegas, uses technology based on the Zigbee standard to automates guests’ rooms. Guests’ security and keyless entry is all connected, as is the valet services and how you open the curtains. The TV and alarm is also integrated to provide a service for the guest who can request music and light. Kent says that, in the past, a home-owner would be looking at around £25,000 to £75,000 to kit out a house with automated light and voice control. However, he sees a future where utility companies could provide this as part of the owner’s energy contracts. He says it could cost between £5 and £45 a month for the service and the energy. “A B2B model would be attractive to companies who already have a large number of clients,” says Kent. He suggests such a service may help retain customer loyalty. Customers who have control over their energy usage will waste less. “We will get to a situation in the near future where lack of adequate control is losing money,” says Kent. “There’s no point putting up a solar panel when you don’t turn off upstairs lights because you can’t be bothered to walk up the stairs. Is it not ridiculous that, in this modern age, you can’t click a button downstairs in the kitchen to switch everything off?” Telcos and utility companies have partnered in the last three years to offer packages covering security, energy, monitoring and assisted living. AT&T and Verizon in the US, Telefonica in Europe and Vodafone and British Gas in the UK have launched a range of smart home services, starting from around £8 per month for a basic DIY self-installed package. "Some services are already operational, but the market itself has only started growing in the last few years. There have been a lot of commercial launches in the last two years, and last year was an explosion with many launches,” says Grant. British Gas has partnered with AlertMe to launch two products in the last 12-18 months: a remote heating control, accessed from the web or smartphone; and the Safe and Secure system, to provide an entry level security product for the home. The remote heating application means customers can adjust their heating schedules to their lifestyles and provide customers with control of their spending. The product is around £199 for basic kit, with an additional £50 for engineer installation. “At the moment, it’s all very manual,” says Kassir Hussain, technology director at British Gas. However, there are companies in the US, such as Nest, which learns your behaviour and adjusts the heating schedule accordingly, he says. British Gas has created a new London office to focus on innovation technology. “We want to move in days and weeks, not months and year,” he says. “The market is still very fragmented. But the basic tools of automation in the home are becoming more available.” Grant says one of the main drivers in this market comes from the European Union’s focus on energy programmes for smart metering. “In the UK, the nationwide smart metering programme will begin next year, once you have a smart meter in the home you will have an automation solution in the home quite naturally, it would make sense for utilities to add the additional services to the smart meter,” remarks Grant. Reducing carbon use and energy efficiency is most definitely a key driver, with security of the home and crime prevention also important. These can also be monitored via connected devices on a population level, with the implementation of smart street lighting in towns. This may soon hit British streets as, earlier this year, Glasgow was chosen to receive funding to try and turn itself into a “smart city”. “£40m-50m of the grant is capital and goes into the ability to put in place the sensors on traffic lights, street lighting and so forth. But it is also going to integrate all the different modes of transport,” says Scott Cain, project leader of Future Cities in the Technology Strategy Board. Another driver for the adoption of the connected home is the consumer trend for new devices generally capable of connectivity, such as internet TVs and mHealth and fitness devices. The next natural step is adding that intelligence and communicating that to the end-user, says Grant. But for these intelligent devices to become established, experts agree that standardisation – in how they communicate and what radio networks they use – will be key.